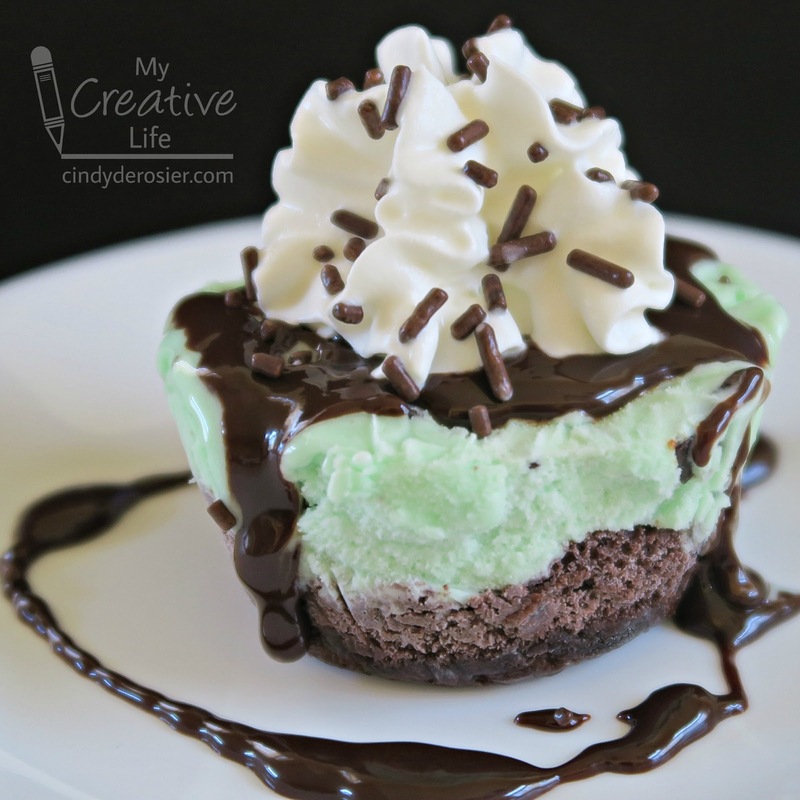 What would you say to some ice cream cake right now? Perhaps peppermint is more your style? 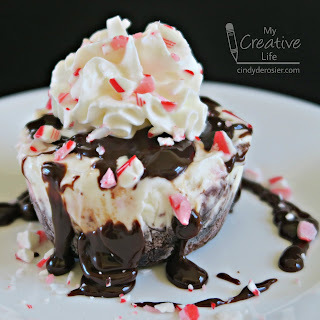 I needed an easy, make-ahead dessert for a crowd that would be simple to serve but still special enough for the occasion. These individual ice cream cakes, made days ahead using muffin tins, were perfect. Prepare the sheet pan by spraying it lightly and lining it with a piece of parchment paper. Spray the parchment paper lightly. Make the cake mix as directed on the package. Pour the batter into the prepared sheet pan. Bake it at the recommended temperature for a 13" x 9" pan, but for half the suggested time. Insert a toothpick or skewer into the cake to test for doneness. Let the cake cook completely in the pan. 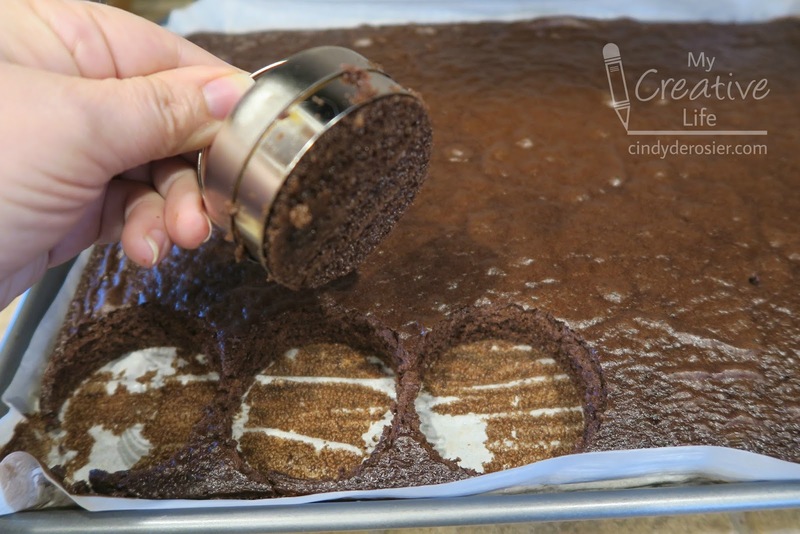 Use a biscuit cutter to cut circles from the cooled cake. You should get 24 total (4 rows of six). 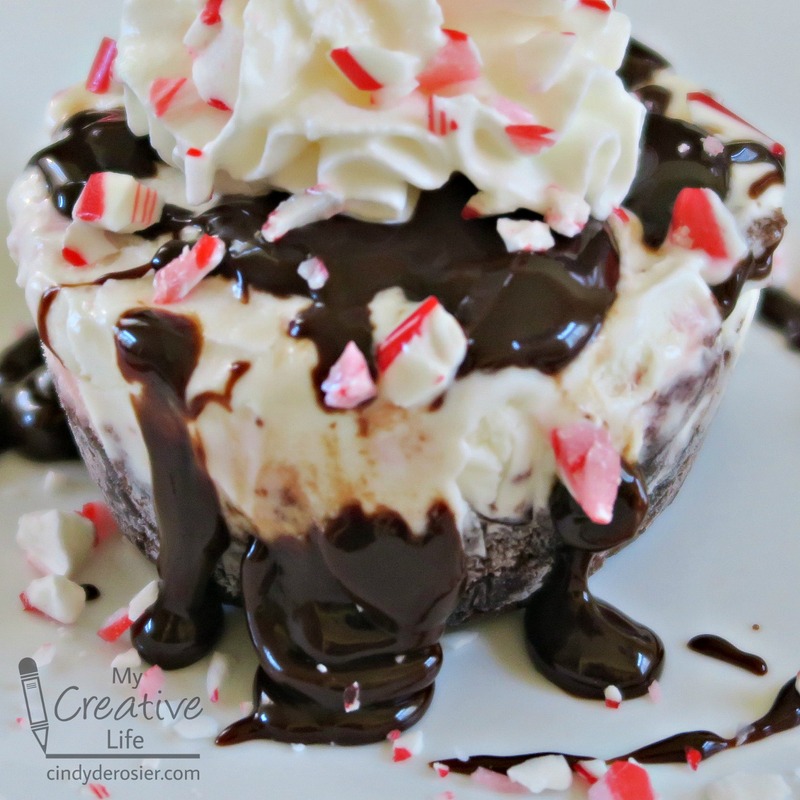 You won't use the scraps for this recipe, so go ahead and eat them as is or use them for cake pops. Remove the ice cream from the freezer and set it on the counter. 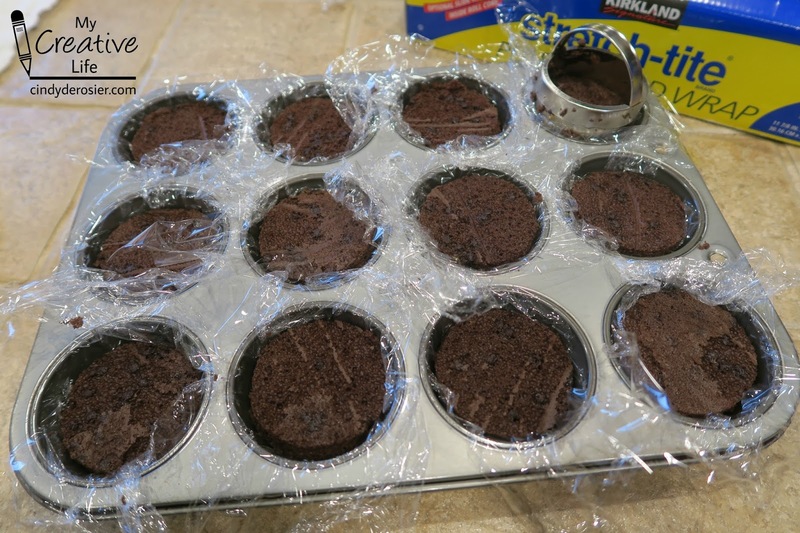 Line each cavity of a muffin tin with a piece of plastic wrap. Put a cake round into each. Scoop about 1/2 cup of ice cream onto each piece of cake. Cover the entire muffin tin with a large piece of plastic wrap. 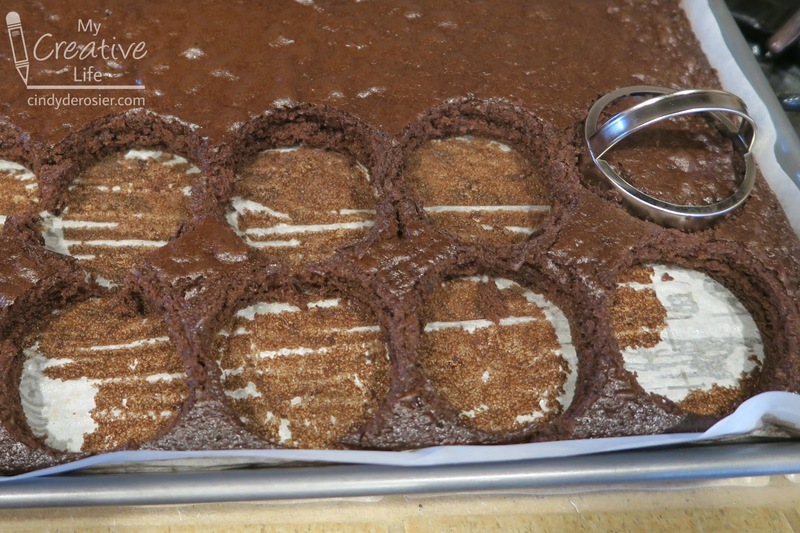 Press down hard on each cake to flatten the cake and ice cream together, like I did on the bottom right. You can use your hand, though after about eight cakes your hand will be painfully cold. I switched to using a measuring cup to pack it down when my hand got too frozen. 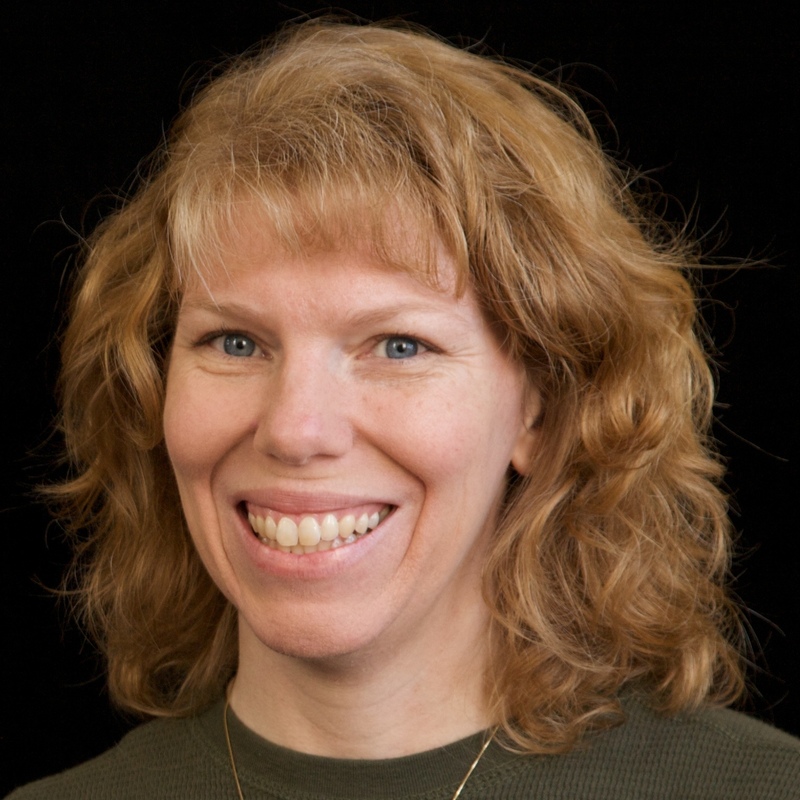 Be sure you are really packing it down and compressing the cake fully. 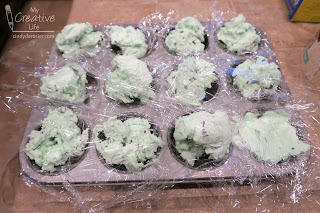 Put the muffin tins into the freezer, with the plastic wrap still in place. Let them freeze solid, at least two hours and up to a few weeks. ... or whatever else you can dream up! Obviously, you can use whatever combination of cake and ice cream flavors you like. I've even made this using slices of quick bread as the base instead of cake. It's all good! If you don't need to serve all 24 at once, just leave the bottom piece of plastic wrap on the extras, stack them in a freezer bag, and return them to the freezer. Now you can eat them one at a time whenever you're craving one! is a 9X13 pan the same as a half sheet? No, a half sheet pan twice as big (18" x 13"). If you don't have one, use a rimmed cookie sheet or a jelly roll pan. 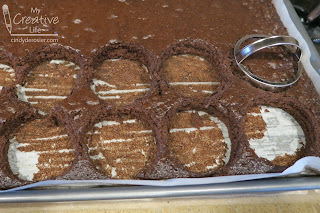 If you bake the cake in a 9" x 13" you won't have much room for ice cream in the muffin tins because the cake will be taking up twice as much room. You could bake the cake, then split it and cut rounds from that though. Sure does look and sound good. I question. When you lay the plastic wrap onto the cake is it then that you put the ice cream on top of the plastic wrap and push the ice cream into the cake? Put plastic wrap into the muffin tin and put the cake on top of that. Then ice cream, then plastic wrap over the top and press down. 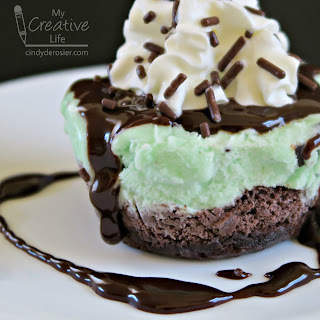 You don't want plastic wrap between the cake and the ice cream! How awesome are these?!?!?!?! I love them!!!!!!!!!!!!!!!!!!! !